Not to toot my own horn…but these are AWESOME!! You won’t even miss the butter, either! Preheat non-stick griddle to 375 degrees. Grind oats into a flour if using whole oats (we throw ours in our blender). Mix all dry ingredients together in a medium mixing bowl – a whisk works great for this…really breaks up the clumps. Mix wet ingredients together in a separate bowl. Stir wet ingredients into dry ingredients until just combined – it’s okay if the batter is a bit lumpy. Don’t over-mix or pancakes will be tough. Test that skillet is fully preheated by sprinkling some water on it – the droplets should “dance” and sizzle. Using a 1/3 cup measuring cup, scoop batter onto the skillet. Pancakes are ready to flip when the edges are slightly dry and the top is covered in bubbles (peak underneath to make sure the bottom is golden brown before flipping). Flip pancakes and cook until underside is golden brown – do NOT flip more than once or flatten the cakes with your spatula. These pancakes rip easily. To keep them from tearing, be sure to slip your spatula under them in one smooth, really quick motion …and you may wish to wipe your spatula clean between batches, as well. Serve immediately or store in fridge/freezer for reheating. I enjoy these plain (I’ve never really enjoyed syrup) – these really are sweet enough to hold their own 😉 Obviously, if you’re not “dairy-free,” feel free to spread butter all over them – I’m sure that’d be delicious! Otherwise, top with pure maple syrup or raw honey! This entry was posted in Recipes and tagged additive-free, breakfast, coconut, dairy-free, flour, food, gluten-free, joes, milk, natural, oat, oats, organic, pancakes, trader, wheat-free. Bookmark the permalink. ← How to Avoid Food Additives! These look amazing! I’ve never thought of using coconut milk in pancakes before, but it’s a great idea for those sensitive to dairy (I’m not, but my mother and some of my clients are). It’s interesting that you changed your diet to deal with fibromyalgia. I have ME/CFS which is supposed to be very similar, and diet makes a huge difference to me. I know you Americans love your thick, fluffy pancakes! Here in the UK, we eat a lot of thinner, soft pancakes – and I find it really easy to make those with a few simple ingredients, avoiding anything I’m sensitive to. 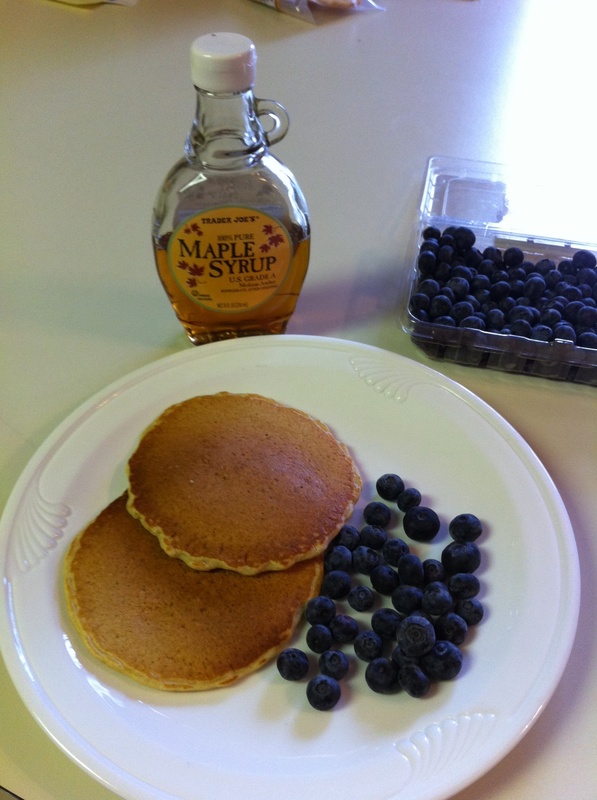 I’ve just posted my recipe for gluten-free, dairy-free pancakes with only 4 ingredients: http://toftsnummulite.blogspot.com/2012/02/week-next-pancake-tuesday.html . Can you tell me about how much oat flour you end up with after grinsding for this recipe? I have a bag of pre-ground gf oat flour that I am trying to use up! Thank you. LOL – not sure why I am having so many ‘typing’ issues on here but that was a sincere thank you! Huh???? Where does it say anything about coconut milk??? I just made these. They’re delicious. I did substitute 1 banana for 1 of the eggs and add 1 tsp vanilla. I would recommend letting the batter sit for at least 15 minutes before cooking in order to allow the oats to absorb some liquid. I think this would really help with the problem of them splitting when you’re flipping. I didn’t have that problem at all! Definitely didn’t need to clean my spatula either. You may need to let them cook longer and slower on one side too.